St Stephen’s new vicar Rev Sue Burns has been officially installed at the Tamahere Drive church. Rev Burns, appointed in May, is well known in the Diocese of Waikato and Taranaki as its Ministry Educator from 1999 to 2008. Since 2008 she served the national church as Dean of Anglican Studies at St Johns Theological College, Auckland, teaching pastoral studies, approaches to conflict and worship ideas. 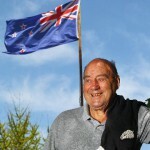 Rex Pickering, a Tamahere community and rugby stalwart, died yesterday (Tuesday, July 5) in Cambridge, aged 79. Pickering and wife Christine were honoured for their more than 40 years of community service and dedication to the St Stephen’s parish two years ago, in August 2014. Pickering, who in life was Waikato’s oldest living All Black, had a lifetime dedication to rugby, representing Waikato at provincial level and the All Blacks for over a decade. St Stephen’s Church’s latest Community Quiz Night is on Saturday, July 2 from 7pm. It’s a chance to get together your own team and test your knowledge prowess – other than against TV’s Mastermind competitors. Teams can be up to six or individuals can go along and join a team on the night to meet neighbours and new friends. The Christmas spirit is sweeping Tamahere and the area’s much anticipated contributions to the festive season in the Waikato get underway this week. The Twilight Tamahere Market is on this Saturday, December 5 from 4pm to 8pm offering everything from stocking fillers to handcrafted jewellery. Gift packs, Christmas decorations, quirky cushions and beautiful artworks will also be among the stalls. Local Blues musician Darcy Perry is being joined by friend and gospel singer Sista Jacqui Baldwin for a concert at St Stephen’s Church on Sunday, December 6 at 7pm. Born in Mississippi and spending much of her life in Chicago, Jacqui learned to sing in church and has shared her talent around the world. Entry to the concert at the Tamahere church is a donation, for example canned food, Christmas pudding and the like, which will go to The Combined Christian Food Bank. Tam Jam organiser Darcy Perry cast grim looks at a grimly grey sky before noon on Queen’s Birthday Monday as his phone rang with the news that there was officially an 87% chance of rain on the parade. Undaunted, Perry and his team continued to set up amps, mics, a mixing desk, a drum kit and an impressive bank of speakers on a 15-metre stage in the St Stephen’s Church grounds. Young volunteers started the barbecue sizzling with sausages and St Stephen’s stalwart Marg Forde delivered hay bales for steps to the stage. Tam Jam 2015 was go! A donkey. A donkey. My church for a donkey, Reverend Ellen Bernstein said (more or less). The vicar of St Stephen’s Church is desperately (kinda) seeking a donkey for a star appearance in an upcoming church service. Anyone with a donkey who would be happy for it to clip clop up the aisle at St Stephen’s Church, Tamahere will be, err, blessed. From the language of computers to the word of God, the new Vicar of St Stephen’s Tamahere has taken a modern day path to an old calling. The Reverend Ellen Bernstein will be welcomed as St Stephen’s Vicar with a service at the church on Thursday, December 11 at 7pm. “St Stephen’s is a very special parish and I feel extraordinarily blessed to be called to this place,” said Rev Ellen of her seven year journey to her first appointment as a vicar. St Stephen’s Church is actively looking for a new vicar following the departure of the Rev Sandy Neal. The full-time position has been advertised by the Anglican Diocese of Waikato and Taranaki with applications closing this Friday, July 18. The new Vicar at St Stephen’s will be blessed by a welcoming, inclusive church family full of potential to respond to those in need, reads the advertisement. Christmas at St Stephens Anglican Church, Tamahere, is a time to reflect. “The church gets decorated around the true message of Christmas,” St Stephen’s Christmas Festival spokeswoman Denise White says.